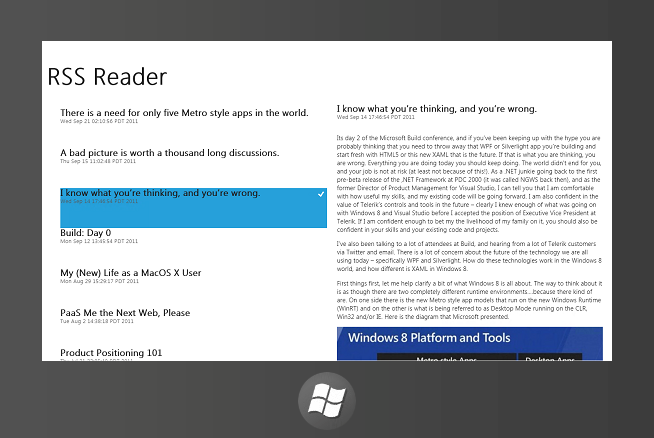 In a previous post I discussed the five different types of Metro style apps that are relevant for Windows 8. In this series I will walk you through building a basic data-snacking application. For review, a data snacking app is one that enables users to consume small chunks of information in a hurry, as time permits. These apps are used regularly and repetitively by users during “down-time” (e.g. waiting in a lobby, on the metro (pun intended), before a meeting, etc.). 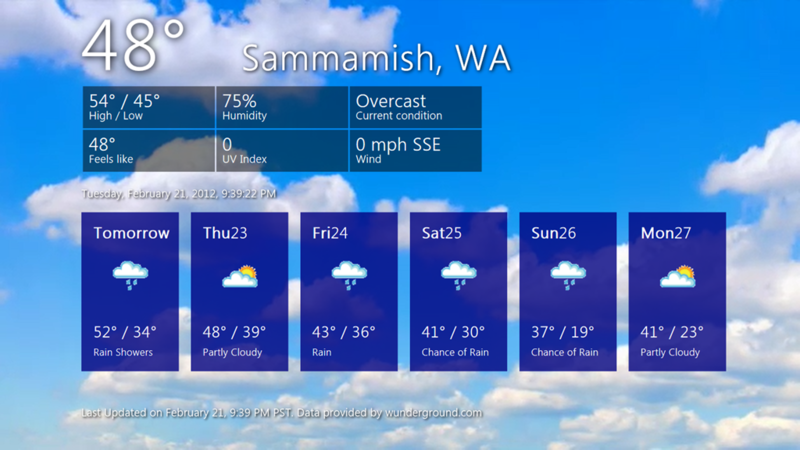 For the purpose of this walk-through I will build a weather app, similar to the Weather app included in the Windows 8 Developer Preview release. This weather app, named “Seven Days,” will show the current weather conditions, plus the forecasts for the next six days (seven days in all, hence the name). In this post I will build the app to get weather data based on a static (aka hard coded) location, and in follow-up posts I will add the ability to get the weather info based on either the current location of the device the app is running on, or through user input of one or more locations. Using Visual Studio 11 Express for Windows Developer Preview, I create a new Fixed Layout project and get to work. I tend to think in user experience first, and prefer to start with my UI layout before anything else. Looking at the screenshot above, there is a basic structure I need to build – three rows (one in the middle row—outlined in a green dashed line below—for the current weather detail, and one in the bottom row—outlined in a red dashed line below—for the forecast) with two grids (the current weather detail grid—outlined in a red solid line—and a forecast grid—outlined in white). The first two rows are pretty straight forward – I’ll use a set of DIV elements for the current temperature and location in the top row, and a TABLE with DIV elements for the current weather detail in the middle row. This is pretty straight forward, so I won’t go into any detail on it. I also spent some time on CSS definition, to make it look nice. Nothing surprising in the CSS, and it is available as part of the sample download. For the bottom row, I anticipate getting a feed of data from a weather service, and binding that data to a grid layout with a single row of six items. The ListVIew control (WinJS.UI.ListView) works in just that way. I can use the ListView to create a grid layout and use a template to define how the items in the grid will look. In this case, I want a grid where each item shows the date, a weather icon, the high and low expected temperatures and a brief forecast on the conditions of the day. The ListView is a DIV element with a data-win-control attribute set to WinJS.UI.ListView. I’ve also set the data-win-options attribute to define how I want the ListView to render (use an item template named “template”, layout as a grid (as opposed to a list), and have no more than one row). The use of the template is key; this is what enables me to define the look of each item that is rendered in the grid. A template is a DIV with the data-win-control attribute set to WinJS.Binding.Template. This enables it to be the template used when data bound to a source (don’t worry, I’ll get to that soon). Inside the template I have defined how I expect the data source to be bound to the UI elements. Using the data-win-bind attribute I define the element attribute to bind, and the data source item’s property to bind to. In the IMG element example, I have specified that the SRC attribute should be bound to the item.IconUrl value and the ALT attribute should be bound to the item.IconAlt value. The next step in building Seven Days is to get some real data. There are a lot of weather Web APIs to choose from, and I’m not here to tell you which one to use. For the purpose of this example I have chosen to use Weather Underground (Wunderground.com) because they provide their results in JSON format, have clear pricing structures (including a free Developer level) and will provide up to 10-days of weather forecasts (many other weather Web APIs only provide 2 or 3 days of forecasts). // WinJS.xhr is an async wrapper for the XMLHttpRequest class. The apiKey value is provided to you when you create an account on wunderground.com, and the loc value is whatever predefined location string you want to use (I am using “WA/SAMMAMISH”). Anytime you are invoking a method that could take longer than 50-milliseconds, the guidance is to use an asynchronous method, which enables the UI to continue working while the asynchronous method executes. That is exactly what the “promise” object and “then” method enable. When the promise object is invoked, the code flow surrounding the promise continues (e.g. the next line of code is executed) and the asynchronous (promise) method is invoked on another thread. This enables long running operations (like retrieving data from a Web API) to be called without blocking the UI functionality, resulting in a much more responsive (aka “fast and fluid”) application. Consider the following example, where two asynchronous calls are made to get data from Bing.com using the Promise/Then model. When the application runs, the progress callback is called every time the XMLHttpRequest object being used changes its ready state. Since each of the requests is running asynchronously, the results are intermixed, and the UI is refreshed without blocking any responsiveness. // Add an event listener for the button’s click event. onProgress2 // Call a different function to show progress. Now that I have data coming from a Web API, the last thing I need to do to get Seven Days working, so I can see the fruit of my labor, is to populate the UI controls with the appropriate data. The data from the WinJS.xhr() call is returned when the “complete” callback is invoked (i.e. processWeather()). The processWeather function uses the JSOPN.parse method to create objects from the data returned. To make setting UI attributes easier, I create four objects from the JSON results returned by the Web API. Each of these objects will be used to populate different parts of the UI. weatherData represents the entire JSON result set. currentObservation represents the current conditions for the specified location, including an array of weather stations nearby and temperature, as well as some, but not all of the details (like UV index, wind chill, condition, humidity, wind direction and wind speed). currentForecast represents forecast data for the current day (the first item in the forecastday array), including expected high and low temperatures. forecasts is an array of forecasts for the current day and the following 9-days (the Web API request specified a 10-day forecast) and will be used to display the lower table of forecasts. To populate the UI I am using a combination of explicit value setting and data binding. As the app develops, and I add the ability to get weather for multiple cities, I may move to an entirely data binding model, but that is overkill for the app right now. To do the element value setting (for the top two rows), I am going to steal borrow an id() function from the Windows 8 SDK samples to make setting values easier. tempString = tempString.indexOf(‘.’) > 0 ? With the top two rows populated its now time to build the data source for the lower grid and bind the ListView control to the data source. To build the data source I loop through the forecasts object that I created from the JSON results (skipping the first item, which is today’s forecast), and create an array of forecast items with specific properties that will be displayed. Once the loop has iterated six times, I break out of the loop (remember, this app is Seven Days, not Ten Days). The last step is to set the data source of the ListView control to the array that was just created. To trigger the binding of the UI elements to the data source, I need to invoke WinJS.UI.processAll() which processes all declarative controls so that any that are data bound get processed and the data is rendered on screen. 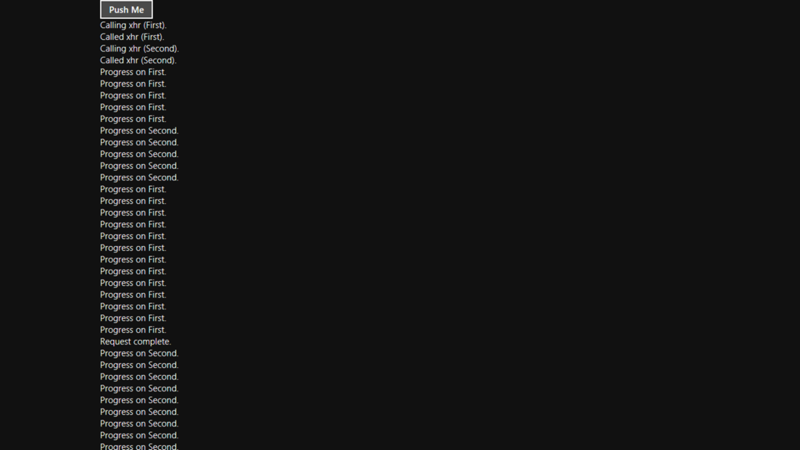 I have this call in the default.js file as the last line of the initialization function. With that, I now have a functioning weather app (there is some CSS styling I didn’t show in this post, but is in the sample code). how change the UI when the device orientation changes. In the final set of posts I will show you how to port this application to the iPad and Android tablets to extend the reach of your application. Every time I go to talk to folks about Windows 8, the same questions pop up. I blame this largely on Microsoft’s silence about Windows 8 following the release of a tidal wave of information followed by the Windows 8 Developer Preview at Build in September. C’est la vie. This too shall pass. // Define an event listener for the onselectionchanged event. For example, the Metro style RSS feed reader application uses WinJS to manage a lot of the UI look and feel, data binding and how you interact with the application, including controls, animations, etc. All of that functionality will have to be rewritten in non WinJS format. You have to rewrite the data binding of the feed items to the HTML layout. That doesn’t feel very portable. 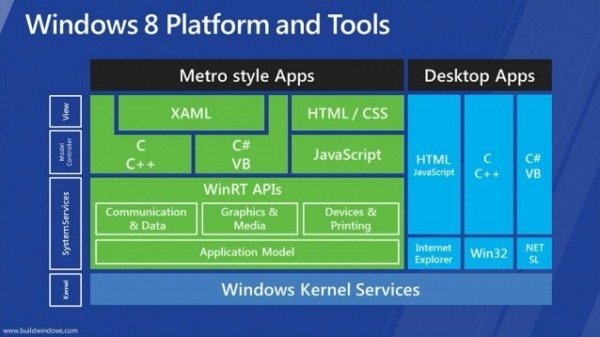 The conclusion is that your language choice when building a Windows 8 Metro style application has next-to-nothing to do with portability. So what should your language selection be based on? Comfort. Microsoft architected an application development stack that does what Microsoft does best – provides flexibility and gives YOU choice. If you want to build an application for Microsoft’s upcoming platform, you can choose the language that you are most comfortable with. Microsoft isn’t making you learn an entirely new stack – just learn the new bits – and use the skills you already have. If you are a .NET developer currently working in WPF or Silverlight, then XAML+.NET will be right up your alley. Sure you will have to learn WinRT and some new syntax, but most of what you need to know you already do. 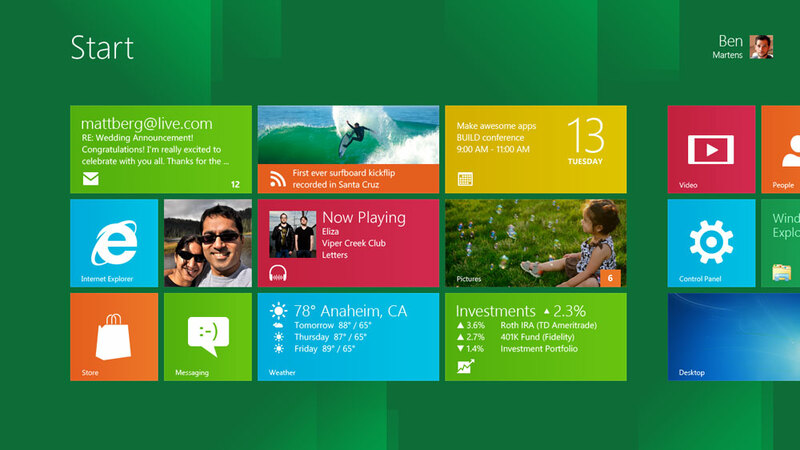 Either way Microsoft has made developing for Windows 8 very approachable. Make your language selection based on your skillset and what is comfortable for you. Don’t feel like you have to lean a new language. Use what you know. There is a need for only five Metro style apps in the world. Over the past week I have spent some time playing with Windows 8 and the Samsung Windows 8 Developer Preview Device (SW8DPD). If you’ve spent any time lurking around the Start page or trying out the Metro apps you’ve likely come to the same conclusion I have. There are only five (5) Metro style application types. All of the Metro style app samples in the Windows 8 Developer Preview fit pretty nicely into one of these five categories, which leads me to assert that these are the five intended categories for Metro style apps – anything else is meant for Desktop mode. In my earlier post (I know what you’re thinking, and you’re wrong.) I talk about Visual Studio as a Desktop mode application – some applications just aren’t metro sexual style. So if Visual Studio is—as an example—not meant to be Metro style, what is? What are the five application types. First let me inventory the Metro style apps (I am excluding Windows resources and tools, including Control Panel, Alarms and Store). Whew! That’s a lot of Metro style. Let me group these apps into the five types I believe there are. Consider this your guidebook to Metro style apps. If its not in this list, don’t Metrofy it. Data Snack apps enable users to consume small chunks of information in a hurry as time permits. These apps are used regularly and repetitively by users during “down-time” (e.g. waiting in a lobby, on the metro (pun intended), before a meeting, etc.). If you want to know where people spend their time on a computing device (PC, Phone, iPad), its here in the Social Networking / Communication / Collaboration category. More often than not consumers are using one of the many social networking client apps available (e.g. Twitterific) and in some cases those client apps bring-together (or mash-up) multiple social networking APIs (e.g. TweetDeck) or other unique options. Consumers, and especially device users, are expecting more out of content than simply text. More often than not content is being delivered in rich ways, more like well produced magazines (e.g. Flipboard) than just content feeds. The magazine-style applications are evolving to deliver more richness thorugh integrated media (e.g. Memories use of photos and videos). Based on the proportion of apps in this category, it feels like this is where Microsoft would like to succeed (it also happens to be where iOS is killing it). Games are the king, and probably will be. If you haven’t played Angry Birds, then you live on an island and are likely reading this off a print out that floated to you in a bottle because you don’t have WiFi, an iPad or power. It is ridiculous how much time we all spend playing games. But not XBox games…casual, easy to play games…like Angry Birds, or Mafia Wars, or CityVille (over 20-million users). This category is about highly graphical, fully immersive games. These are typically produced by game studios and include racing games, first person shooters, and other fully immersive, highly interactive games. These are games that would be most likely built for Windows 8 with DirectX and C/C++. So there you have it, the five types of Metro apps – Data Snacks, Social Networking/Mash-ups, Content/Media, Casual Games and Graphical Games. Two things are missing – the Build app (maybe this is a content app, but mostly it’s a tax – how could Microsoft give out devices at Build without a Build app), and Line-of-Business (LOB) apps. Frankly, unless you are building a touch-centric app for agents using 3G devices in the field, Metro style is no style for LOB. 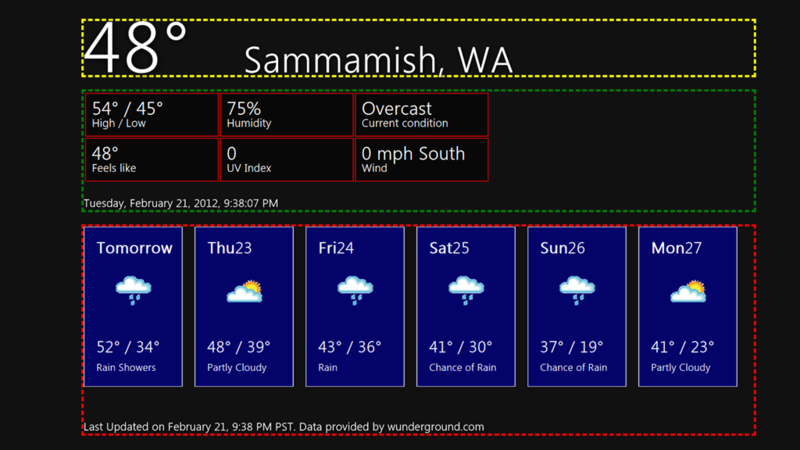 Stick with Desktop mode and Silverlight/WPF for LOB apps.